While buying a new smartphone, we often prefer to check its camera quality because we are fond of taking lots of photos with our smartphones. But the biggest trouble is that when we buy a phone with high-resolution cameras, it always captures images with a big file size that are difficult to share on Whatsapp and Facebook. These images also demand more space in device memory so the best idea is to find a solution to reduce the size of these captured photos. Compatible with Android 3.2 and up. Can resize photos in batch. Photo Compress 2.0 allows users to resize images by choosing compress quality manually as high, medium or low. Users simply need to choose the compression level and press compress button to get a new image. You will never notice any decay in image quality of the compressed image. Using this interactive app, users can easily resize, crop and compress batch collections. Whereas the pro version of Photo Compress 2.0 offers many new options like keep EXIF data of images. The great news for adventure lovers is that this ad-free app also allows easy sharing of compressed images. However, the free version of the app can resize only 10 pics so if you want to enjoy unlimited editing, prefer to move to a paid version of this app. Compatible with Android 3.0 and up. If you love to share captured images on social media platforms but are not able to do so due to heavy file size, it is good to install Reduce Photo Size app on your smartphone. This app will help you to resize your photos to get reduced file size and allows direct sharing on Facebook, Twitter and emails as well. Note that, this application does not compress photographs, rather it resize them to lower version so that it contains lesser memory space; however, the photo quality stays the same. 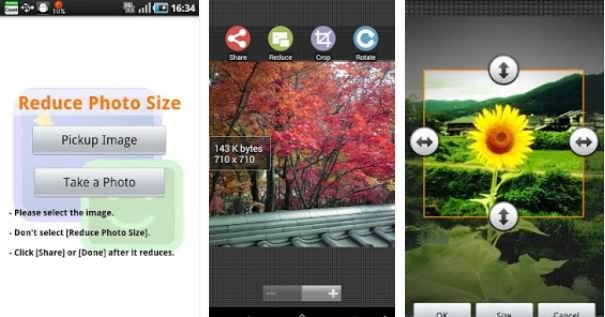 This app not only works for resizing images, it can also be used to crop and rotate photos. Reduce Photo Size app is available for free but it keeps on displaying many annoying ads. Compatible with Android 4.0.3 and up. Here is a fast and easy solution for your picture resizing needs. Photo & Picture Resizer never reduce the quality of images; it simply works on the adjustment of image size to get the desired file size. You can send your resized pictures directly to web forms, Instagram, emails, Facebook and even via text messages. This application is available for free to all android users; however, you may find many in-app purchase options. It makes resizing process quite easier with a user-friendly interface where users do not even need to save resized images manually; they are saved automatically to separate folders in your handset. Few unique features of this app are the abilities to define custom photo resolution, browse images by gestures and direct social media sharing. Can resize one image at a time. For Android 4.0.3 and up. Pixlr Express is one of the most popular photo editing apps for android users. It is loaded with several impressive features, effects, and utilities that can help you to achieve unique touch for your photographs. Even beginners can use this app with ease with its interactive UI to edit their heavy images. It is not just limited to editing; rather you can also use Pixlr to crop, rotate and resize your photographs. Other than this, you can use this application to do advanced editing task like to adjust the red-eye effect, photo colors, brightness and contrast. You will be happy to hear that Pixlr Express has more than 600 effects to offer you easy editing; it will definitely help you to impress your friends with amazing photo collects with special effects. In simple words, with Pixlr Express, you will be able to get full editing capabilities on your tiny handset. Can resize multiple pictures at a time. 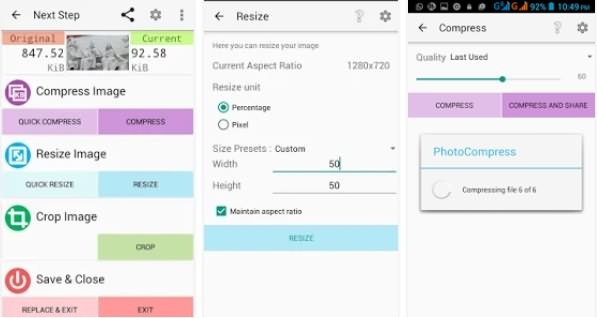 If you are in search of some easy to use solution to resize your heavy image son android devices then Images Easy Resizer & JPG-PNG is a great choice. It not only changes the size of your images but at the same time it can also help you to change image formats and can also rotate images. The easy to use interface of this user-friendly app makes everything possible with few swipes on your handset screen. Users can easily define custom file sizes to achieve the specific size of images; however, users can easily make a selection between fixed aspect ratio and variable aspect ratio for image resizing. All these apps are loaded with several impressive features and offer compatibility with almost all latest android phones. So, you can choose your platform easily to start editing your heavy images instantly and share them on social media to impress your friends online. Although free versions of apps are also featured rich, you may have to compromise for annoying ads so make a wise decision to find the best image compressor tool.